Barack Obama became the first American President to visit Myanmar on Monday, using a six-hour trip to balance US praise for the government's progress in shaking off military rule with pressure to complete the process of democratic reform. The Irish Cabinet will take up a report of an expert group on abortion tomorrow as thousands of people in Ireland protest the tragic death of an Indian dentist. Record-setting Indian-American astronaut Sunita Williams along with two fellow cosmonauts safely returned to Earth today from the ISS, touching down on the steppes of Kazakhstan, after spending four months in orbit. 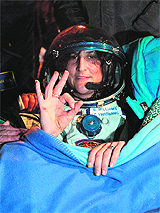 Sunita Williams gestures shortly after her landing in the Soyuz capsule in Kazakhstan on Monday. Obama, greeted by enthusiastic crowds in the former capital, Yangon, met President Thein Sein, a former junta member who has spearheaded reforms since taking office in March 2011, and opposition leader Aung San Suu Kyi. "I shared with President Thein Sein our belief that the process of reform that he is taking is one that will move this country forward," Obama told reporters, with Thein Sein at his side. 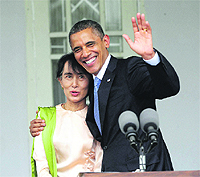 "I recognise that this is just the first steps on what will be a long journey, but we think that a process of democratic reform and economic reform here in Myanmar... can lead to incredible development opportunities here," Obama said, using the country name preferred by the government and former junta, rather than Burma, which is used in the United States. Thein Sein, speaking in Burmese with an interpreter translating his remarks, responded that the two sides would move forward, "based on mutual trust, respect and understanding". "We also reached agreement for the development of democracy in Myanmar and for promotion of human rights to be aligned with international standards," he added. Obama's Southeast Asian trip, less than two weeks after his re-election, was aimed at showing how serious he is about shifting the US strategic focus eastwards as America winds down wars in Iraq and Afghanistan. The so-called "Asia pivot" is also meant to counter China's rising influence. The trip to Myanmar highlighted what the White House has touted as a major foreign policy achievement, its success in pushing the country's generals to enact changes that have unfolded with surprising speed over the past year. Tens of thousands of well-wishers, including children waving American and Burmese flags, lined Obama's route from the airport after his arrival, cheering him as he went by. Obama met fellow Nobel Peace Prize laureate Suu Kyi, who led the struggle against military rule and is now a lawmaker, at the lakeside home where she spent years under house arrest. Addressing reporters afterwards, Suu Kyi thanked Obama for supporting the political reform process. But, speaking so softly she was barely audible at times, she cautioned that the most difficult time was "when we think that success is in sight". "Then we have to be very careful that we are not lured by a mirage of success and that we are working towards genuine success for our people," she said. The Irish Cabinet will take up a report of an expert group on abortion tomorrow as thousands of people in Ireland protest the tragic death of an Indian dentist. Irish Health Minister James Reilly said he would be bringing the report of the expert group to the Cabinet tomorrow. Savita Halappanavar died in an Irish hospital last month after doctors refused to terminate her pregnancy despite telling her that she was miscarrying. 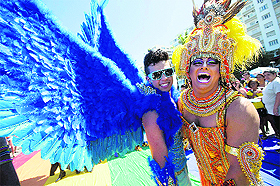 She died of blood poisoning after spending three days in pain and agony. Speaking on the Ireland's National Television, Reilly extended his sympathies to Halappanavar’s family and said they would have input into the terms of reference for the inquiry into her death. "I have read the report and I need to study it further. It's a hugely complex issue that has divided the country... and we're not going to solve it in a matter of weeks," he said. Williams, who commanded the International Space Station's Expedition 33 mission, and two astronauts, Flight Engineers Yuri Malenchenko and Aki Hoshide, touched down in the dark, chilly expanses in the town of Arkalyk on board the Russian Soyuz capsule at 0726 IST. NASA spokesman Rob Navias said during the landing commentary, “The crew is home.” Williams, 47, Russian cosmonaut Malenchenko and Japanese astronaut Hoshide sported broad smiles after being extracted from their capsule. They sat in reclining seats under thick blankets to stay warm in the frigid cold before being moved to a inflatable medical tent for post-landing checks. The crew's physical condition was “normal” after the landing, a mission control spokesman was quoted by RIA Novosti news agency as saying. Some of the Soyuz's landing activities occurred a few seconds late, causing it to overshoot its landing site, but Russian recovery teams were able to compensate for the change during the descent, Navias said. The return of Williams, Hoshide and Malenchenko wrapped up a 127-day space journey, including 125 days spent aboard the ISS, since their launch from the Baikonur Cosmodrome in Kazakhstan on July 15 this year. Williams, now has spent a total of 322 days in space during her two long-duration missions. She previously served aboard the ISS as an Expedition 14/15 flight engineer from December 9, 2006, to June 22, 2007.